No-one wants to do something embarrassing when they go out dancing and there are centuries of traditions to ignore, so here's our rough guide to ballroom etiquette. Yes and no. Almost everything on this page is just common sense and common courtesy. If you're generally polite and considerate of others, it's unlikely you'll upset someone just because you went out dancing. On the other hand, a lot of people get nervous the first time they go to a big ballroom event: there are lots of traditions and until you've been you don't know which ones people still follow. Also, some of the conventions during practice sessions and private lessons aren't obvious until you've been a couple of times, so you might like to know in advance how things usually work. This is the 21st century, and it's perfectly acceptable for ladies to ask men to dance as well as the other way around. Traditionally, to invite someone to dance you would ask something like 'May I have this dance?' or 'Would you like this (dance name)?' These are still commonly used, but no-one's going to be offended if you're less formal about things, particularly in a crowded beginners class! If you don't want to dance with someone, it's perfectly polite to decline on the basis that you're sitting that one out, but it's rather bad manners to go and dance to the same music with someone else instead if you've done this. (The exception, obviously, is if you had already agreed to dance it with that other person when you were asked.) If you don't want to dance that particular track but you're worried about upsetting someone who has asked you specially, you can always offer to find them for a different dance later. The corollary to this is that you shouldn't be upset if you ask someone to dance and they turn you down. It happens all the time, and it's probably not your fault. People get tired, need a drink, prefer different rhythms, or just don't like a particular piece of music. Also, just because someone turned you down, that doesn't mean you can't ask them again later, particularly if they said they'd come and find you when they declined before. If you're turned down by the same person twice, you might want to wait and see if they ask you to dance later instead, as they might have a good reason and you don't want to hassle them. You'll find dancers at levels from beginner to professional at CDC events. Naturally, people will dance mostly with others of a similar experience level. However, there's no rule against asking someone to dance just because they're much more experienced than you are. The worst that can happen is that they might say no! Just consider how you'd feel in their position: if you were a world champion and the same two beginners kept asking you for every other dance, you'd probably find it very annoying, but equally if no-one ever asked you at all you might start to worry! If someone has come with a partner, it is normally assumed that they will dance the first and last dance of the session with that partner, so it's unwise to ask them for a dance at those times. At traditional ballroom events, the last waltz is usually announced so you have time to find your partner before the music starts. It is also worth noting that just because someone has said yes to a dance it does not mean they've consented to anything further! Please do not harass people at classes, socials or competitions - nor, indeed, in the rest of your life beyond the CDC. Dancing is a contact sport, as the saying goes, and inevitably on a crowded floor you'll brush up against other couples occasionally. However, this is not an excuse to charge into them with reckless abandon, particularly using your partner as a battering ram! Always be considerate of others: if you can't dance around a couple who are in your way, it's much better to stop, let them move off and then carry on than it is to hit them, trip them up or step on their toes! In Latin dances, be aware of the space around you before you start shooting out those arms or flicking your legs all over the place. In Modern dances, if there's not a lot of room, ask yourself whether it's really a good time to do that big, sweeping line figure from your class last week or to practise your quickstep charges in and out of the other couples. Also, be aware that just because you're dancing a routine you learned at a class, not everyone else will be doing the same. You might have got away with stepping backwards without looking when the couple behind you were doing the same thing at the same time, but in a crowded social dance they might not be! The rule for choosing which figures to dance is simple: if in doubt, don't. This one's pretty obvious, really: if you're going out dancing, be in a state where other people would be happy to dance with you! We're not talking about the unkempt look here: it's not obligatory for men to be clean-shaven with hair gelled down like a matinee idol, nor for ladies to spend two hours putting their hair up and make-up on. Just make sure you're clean, and please don't go out dancing in a crowded room if you're bringing some unpleasant lurgi with you. With experience you'll find that some clothes are much more comfortable for dancing on hot days than others, but if you tend to sweat a lot and you're worried, you can always take along a change of clothes. Again, this is mostly common sense. You're probably there with a regular partner and so are most other people, so most of you will be wanting to run through particular choreography or to work on specific figures you've been learning. If music is playing, and you're working on a different dance, it's good manners to give way to couples dancing to the music. Unless there's someone formally running the practice, usually it's OK for anyone to change the music, but do ask other people first to make sure you all get a turn to dance the rhythms you want. At busy sessions, it's common to play several tracks in a row of one rhythm before changing dance, to make sure there is a reasonable amount of time spent on each different rhythm. At any session, never stop the music in mid-track if another couple is dancing to it. If you're at a mixed Modern/Latin session, it's sometimes best to leave the music off until people want a specific dance, as it can be quite difficult to practise your foxtrot when a cha cha cha is playing or vice versa. In any case, never turn the music up so loud that it's uncomfortable for other couples to carry on with their practice. If you're not dancing through choreography, be considerate of those who are. In Modern, don't stop and have a chat in the middle of the line of dance that everyone else wants to charge down; move to the side of the floor, or go into the middle if you need some space to go through a figure but don't want to block people going round the room. In Latin, don't start so close to another couple that you're disrupting their run-throughs, or practise your rumba walks through the space another couple are using to work on intricate choreography they can only just manage. If you're stuck and there are more experienced dancers around, it's not forbidden to ask a question and many couples will be happy to help. However, remember it's their practice time too. Don't distract them while they're dancing or working on something; wait until they take a break. And remember that they're not paying for the time so they can teach others, so be brief. If you don't understand something, don't keep hassling, just make a note to ask your teacher about it later. Finally, please don't stare at other couples during a practice. People are usually working on things they aren't yet confident with at these times, and it can be quite distracting and intimidating to feel someone is watching you all the time. Obviously you'll see what other dancers in the same room are doing, but don't make a point of it. Lesson timetables are usually packed pretty tight, so please be on time, allowing for things like changing shoes before you start if necessary. If you're late, your teacher is perfectly entitled to cut your lesson short at the agreed end time, but some will over-run instead and that makes everyone else late too. If you can't make it to a lesson you booked, give as much notice as possible; someone else might be able to take the lesson time instead. If you cancel at short notice or don't show up, you'll be expected to pay for the lesson anyway. 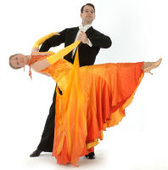 If you're going to a lesson with a ballroom teacher, it's common to wear smart clothes. Some teachers at CDC lesson days might be less formal, but if it's your first time having a lesson with a new teacher, you won't go wrong with shirt and tie or the ladies' equivalent. Jeans are best avoided! As with practice sessions, please don't sit there and watch a couple who are taking a lesson. For one thing, it's their lesson and they're paying for it, and it's considered rude to 'piggy back'. (It's also quite dangerous: the advice a teacher gives to one couple might be quite different to what they'd tell another couple on the same subject.) For another thing, it can be very distracting to feel eyes on you when you're trying to understand something new and it's not working yet! Good dance floors are hard to find, and cost a small (or sometimes, not-so-small) fortune when venues buy them, so it's important to take good care of them. It is often useful to brush suede-soled dancing shoes during a dancing session. If you do this, please don't do it over the dance floor where everyone else will just tread in the dirt you brush off. Use a bin, go outside, or find a brushing area with a mat if the studio you are using has one. If the floor is particularly slippery, you can improve the grip of suede-soled shoes by applying a little water. Again, if you are going to do this, don't pour the water onto the dance floor itself, and don't apply so much to your shoes that you're leaving footprints on the dance floor. Never use stickier alternatives, as these spoil the floor. And of course, if you're carrying food or drink, be very careful not to get any on the dance floor. Try to go around the outside rather than walk on the floor itself, in case someone knocks into you and something spills. Never forget that dancing is supposed to be fun, not a means to tie yourself in knots over P's and Q's that you spend the rest of the evening trying to undo. You're there to have a good time, and so is everyone else. If you're not sure about something, just look for someone who seems to know what they're doing and ask politely. Dancers are by nature a pretty friendly bunch, and you'll find plenty of help if you need it. Now stop worrying and go and dance!